VascuComp 3-DVT therapy treatment is intended to decrease the risk of the formation of deep venous thrombosis (DVT) by aiding blood flow back to the heart via lower extremity limb compression. 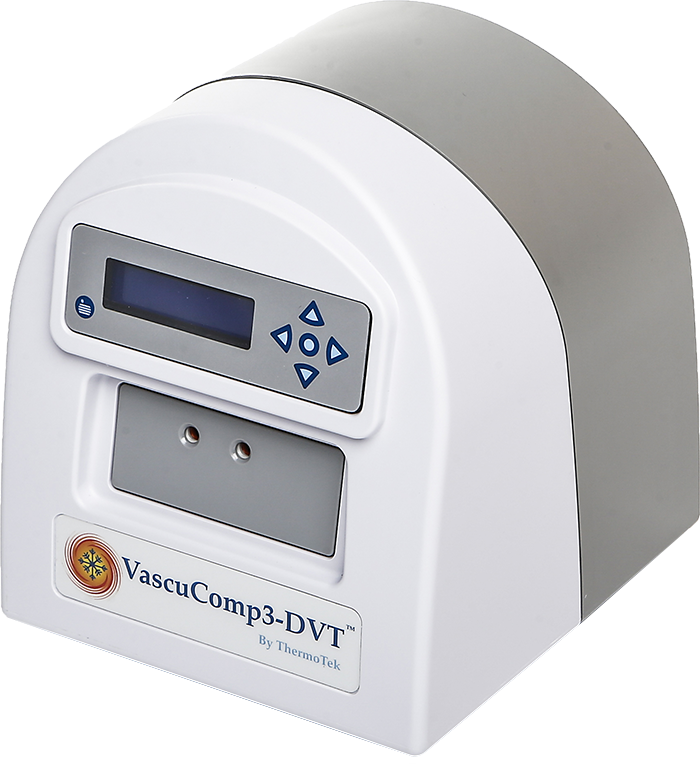 The VascuComp 3-DVT offers highly effective DVT prophylaxis when used with custom designed ThermoTek Calf or Foot compression garments. The foot garments are designed for rapid compression of the arch of the foot to 100 mmHg. The calf garments allow compression of the lower leg to 45 mmHg. Each compression cycle provides a compress and hold interval of thirty seconds and subsequent deflate and rest interval of thirty seconds. Decrease the risk of deep venous thrombosis (DVT). Aids the blood flow back to the heart. Treat and assist healing of cutaneous ulceration (wounds), reduce healing time, enhance arterial circulation (blood flow), reduce compartmental pressures, reduce edema (swelling), reduce the need for anticoagulant (blood thinning) medications.